The museum is the second in its collection of artifacts in Jackson County to the Southern Oregon Historical Society. The museum was originally the Long Mountain School, built in 1925. About 20 years later it was moved to Eagle Point, where it remained a school and then part of School District 9. The community joined together and moved the museum to its current location, opening in 1978. Later additions were made to the building in the 1990’s. 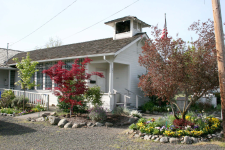 With changes in funding for the county historical societies, the Eagle Point Historical Society asked the city to run the museum in 2008. The museum is available for tours for schools and special events. Please contact the city for more information at 541 826-4212.